Today is the feast of St. Cecilia which is superseded by the Sunday Liturgy. Recently, movements have developed that involve pastors distributing ashes to passersby in public places. This isn't considered taboo, but Catholics should know this practice is distinctly Protestant. 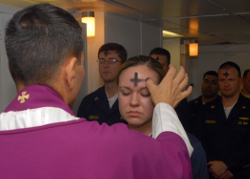 Catholics should still receive ashes within the context of Mass.